Myrtle Beach is a beautiful beach town that is full of southern hospitality and charm. There’s no better place to be a mom than in Myrtle Beach, South Carolina! Located only a short drive from the North Carolina state line, our sixty miles of soft sandy beaches and picture perfect blue Atlantic waters are sought after by thousands of tourists throughout the year. The beautiful Atlantic ocean is perfect for boating, kayaking, paddle boarding, scuba diving, fishing, para-sailing, and just about any other water sport you can think of. You can also take the family to one of our many water-parks, a fun way to spend the day with your family, cooling off from the heat. And if the ocean or water-parks are too much for you we have beautiful Rivers and Waterways lined with giant Oaks covered in Spanish moss and gardens and state parks lined in palm trees and wildlife. And, if shopping is your thing then you’re definitely in the right spot, with all the Outlet Malls, specialty boutiques and flea markets you could spend days just browsing the stores. Myrtle Beach is also known for the family-friendly Amusement Parks, live entertainment theaters and dinner shows. There’s many cultural and historic sites as well, and of course, the best Golf courses in the nation! Yes, Myrtle Beach has something for everyone in the family and we Myrtle Beach moms have it all right in our backyards. But best of all are the people that we call friends and neighbors. How lucky are our children to be growing up in such a wonderful community? 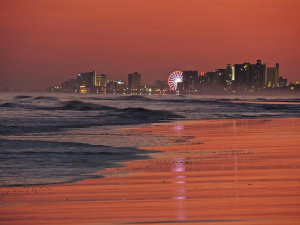 — Myrtle Beach is the place we love to call home!